*You will also need: 1 quart sized ziplock bag & aluminum foil. 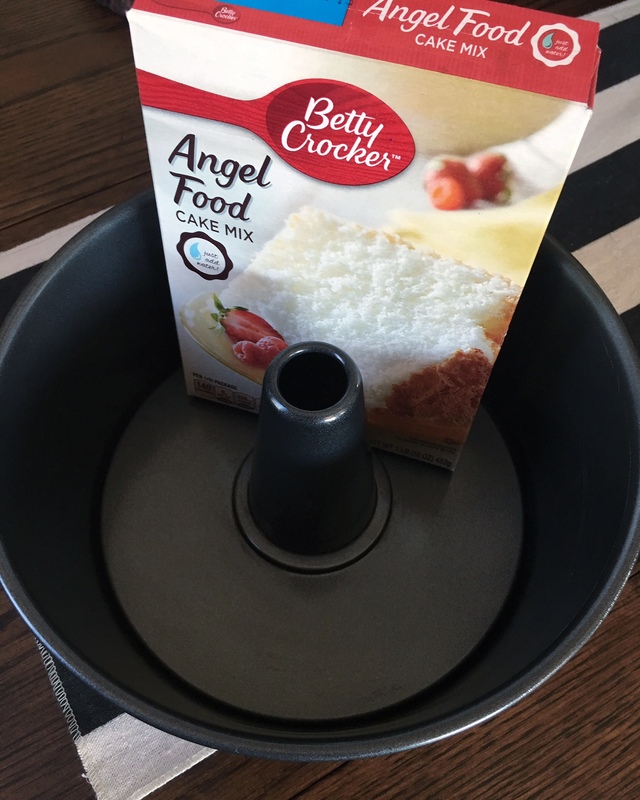 1.Start by making the angel food cake per the directions on the box. I recommend an angel food pan with legs, click here. 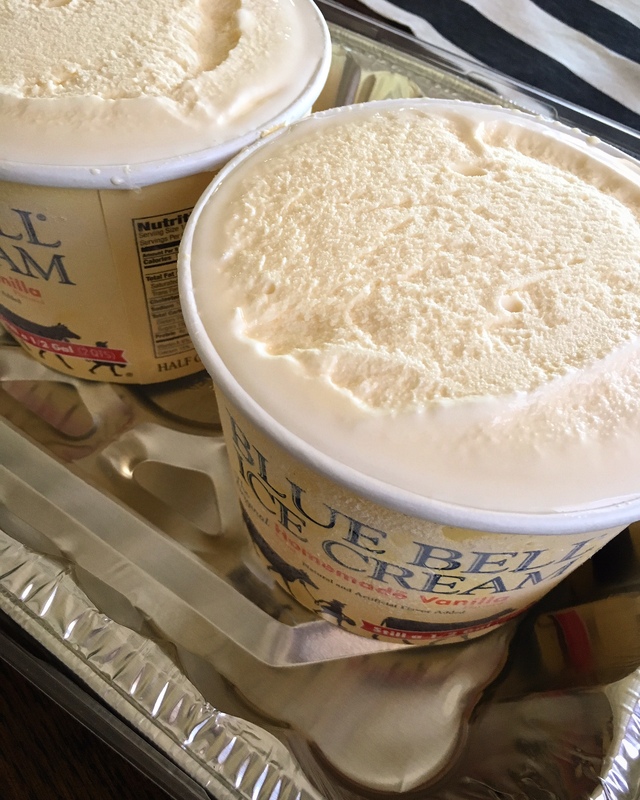 2.While the angel food cake is baking, set out the 2 – 1/2 gallon containers of ice cream to begin softening. To keep your area clean, put them in your foil pan. Let the ice cream sit out for at least 30 minutes. 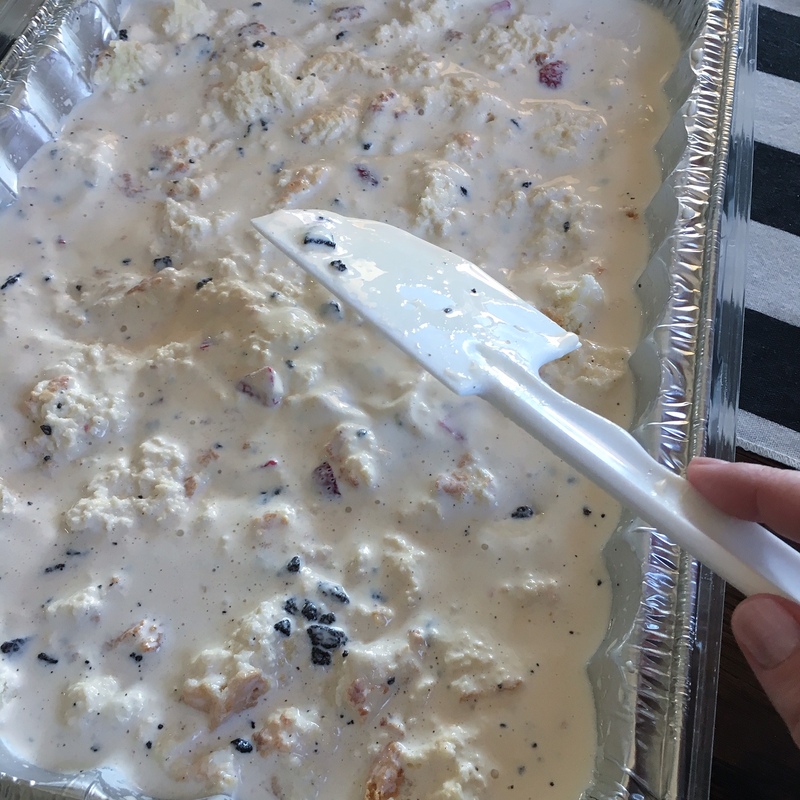 5.Once your ice cream has softened and has become moldable, begin mixing it around and flattening it out evenly in the pan. 6.I love vanilla, so I add 1 tablespoon of vanilla to the softened ice cream. 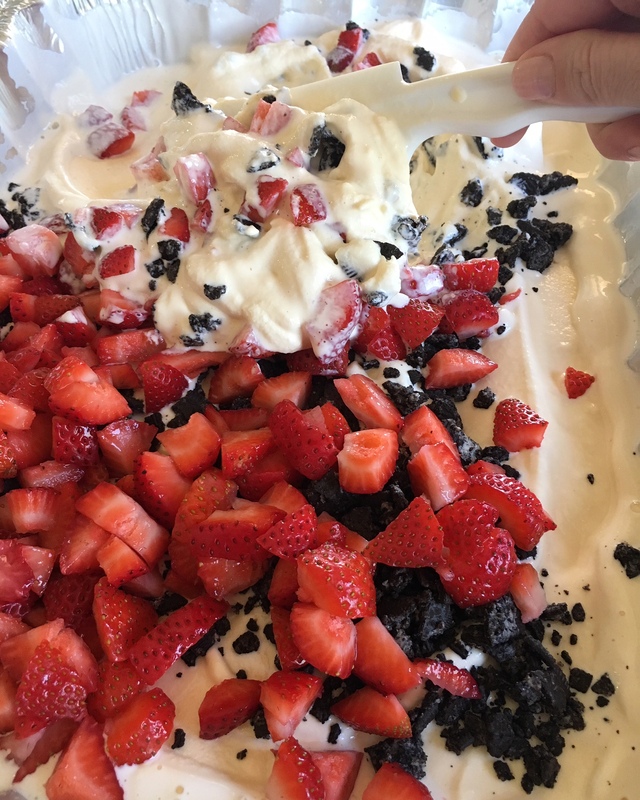 7.Once your ice cream is soft and creamy, fold in the diced strawberries and Oreo pieces. 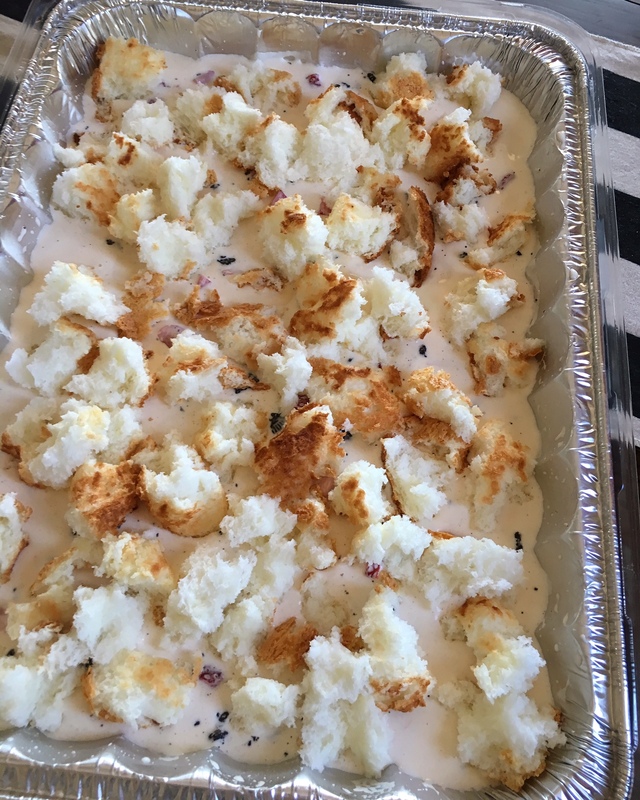 8.Once your angel food cake has finished baking and cooled, cut and/or rip it into small pieces. 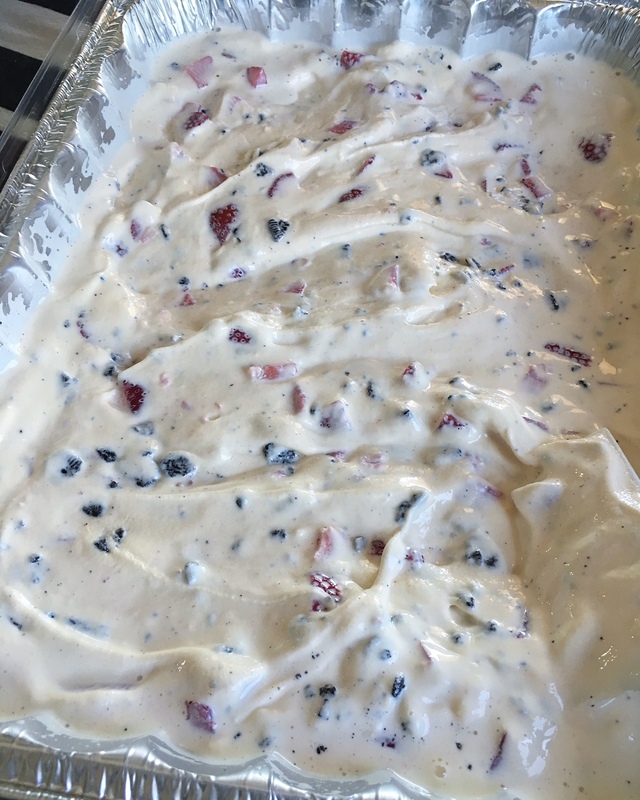 9.Fold your cake pieces into the softened ice cream mixture and flatten it out making a smooth top. 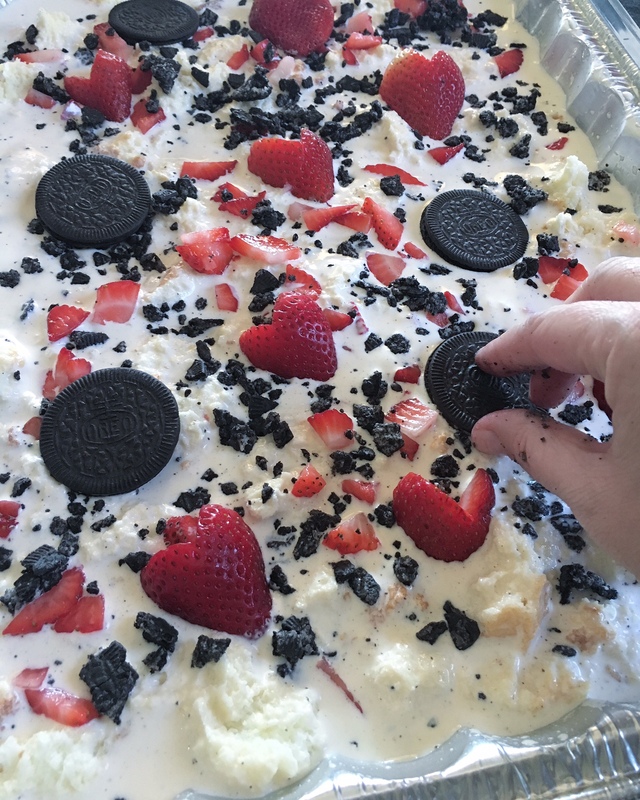 10.Before you refreeze your ice cream cake, decorate the top with your leftover Oreos and strawberries. 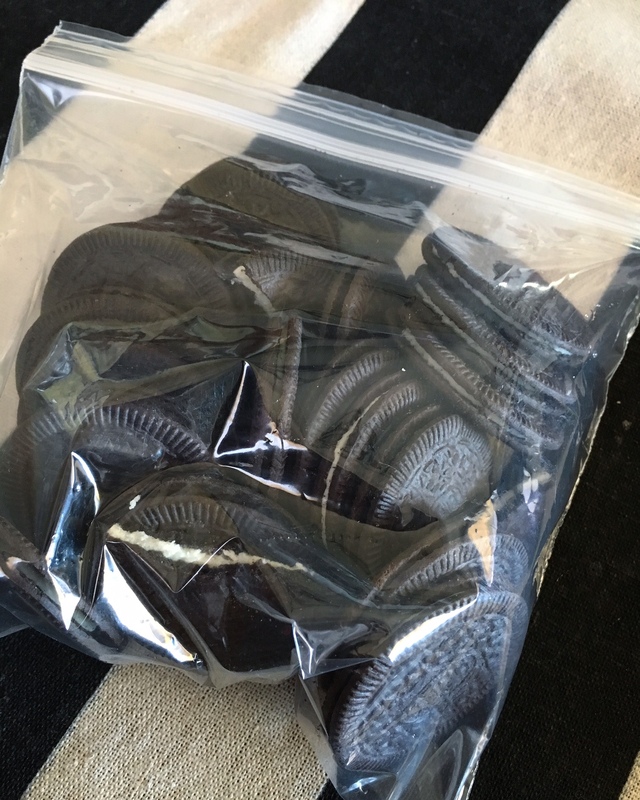 With your saved Oreo Thins, mash up half and sprinkle around, and then place the remaining few whole Oreo Thins strategically around. 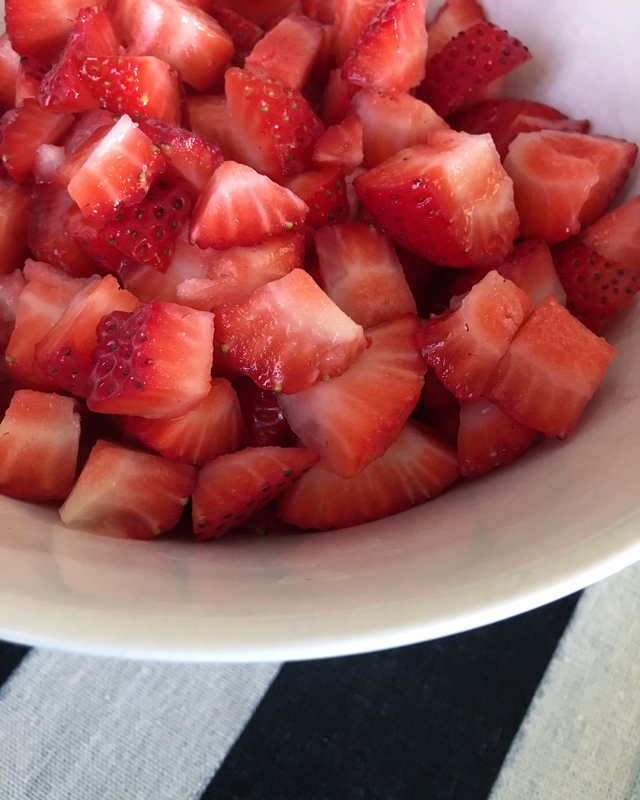 Do the same thing with your strawberries, sprinkle the diced pieces around and then strategically place your strawberry halves in the open spots. These touches make it look extra delicious. 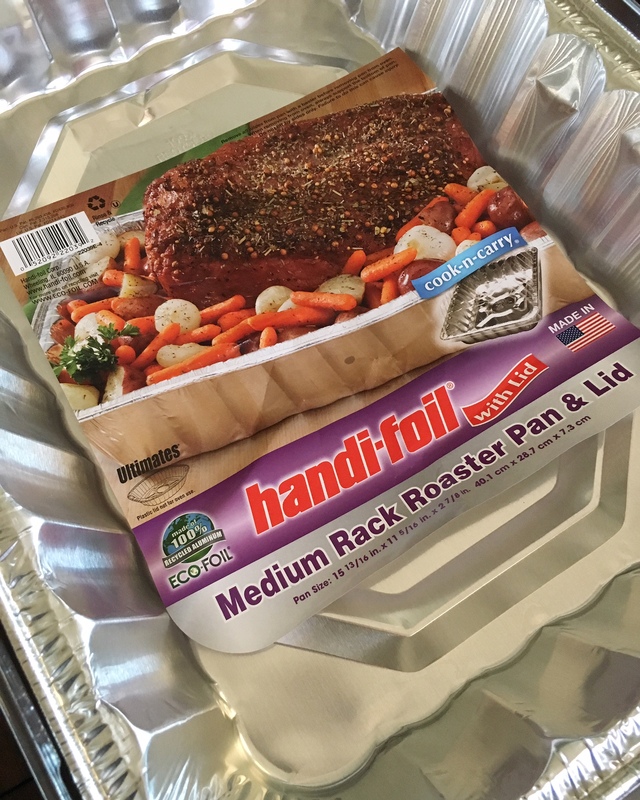 11.Make sure to cover your cake with aluminum foil and/or a lid if your pan comes with one, and freeze over night or as long as needed. 12.Let your cake sit out for approximately 15-20 minutes before serving, so that it is at the perfect softened temperature for your guests. This recipe yields 20-24 heavenly pieces! Do you have a favorite topping? 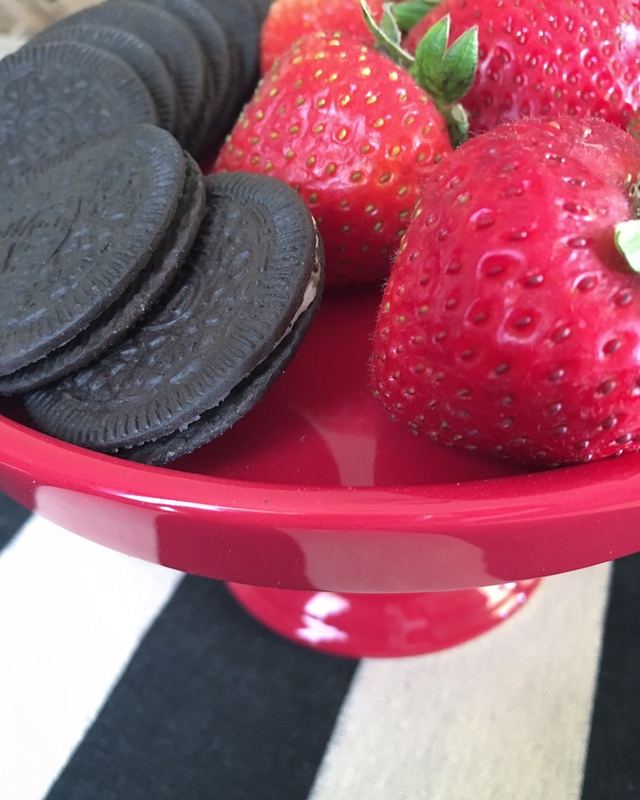 Feel free to mix and match your favorite fruits and sweets into this recipe. I think I am going to do a chocolate, banana and peanut butter version next! 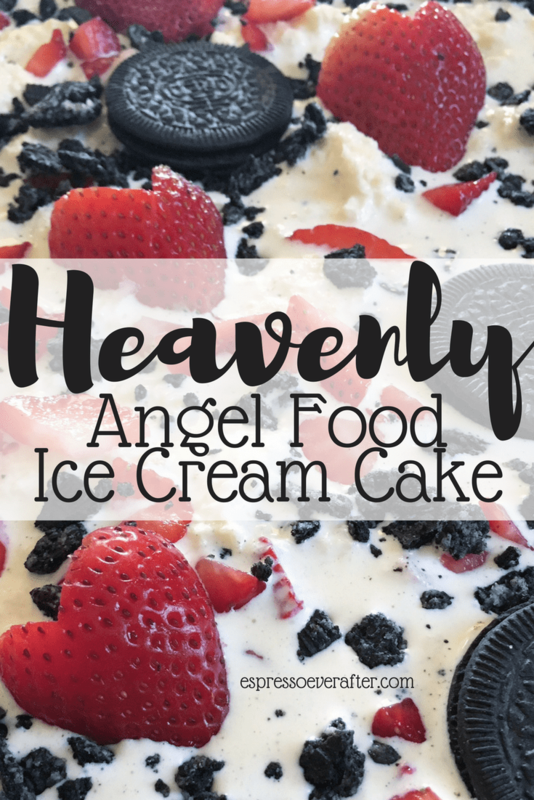 Angel Food Ice Cream Cake | It's Heavenly! Start by making the angel food cake per the directions on the box. I recommend an angel food pan with legs. 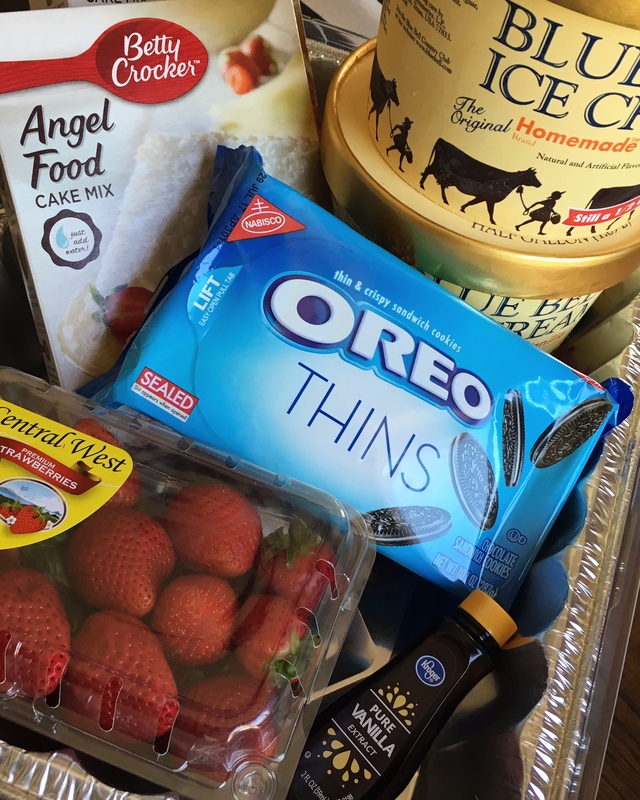 While the angel food cake is baking, set out the 2 - ½ gallon containers of ice cream to begin softening. To keep your area clean, put them in your foil pan. Let the ice cream sit out for at least 30 minutes. 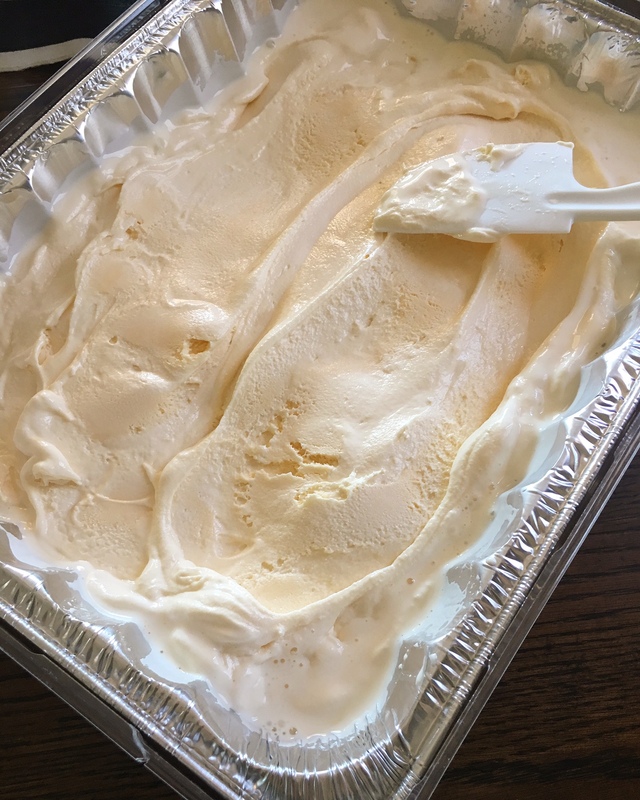 Once your ice cream has softened and has become moldable, begin mixing it around and flattening it out evenly in the pan. 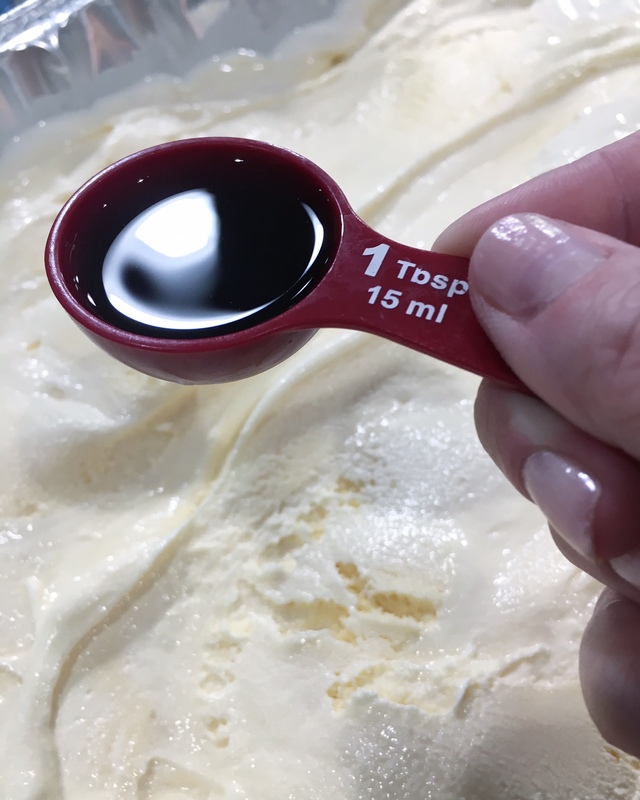 I love vanilla, so I add 1 tablespoon of vanilla to the softened ice cream. 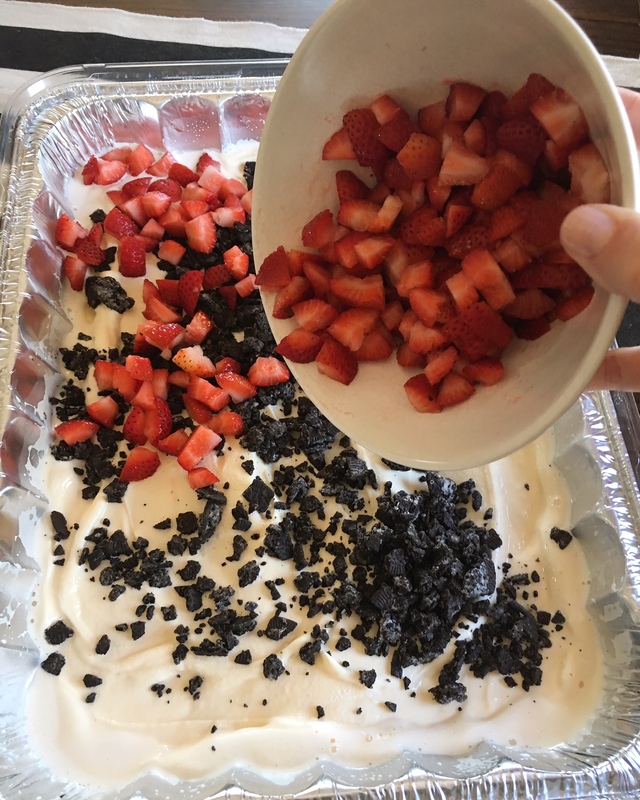 Once your ice cream is soft and creamy, fold in the diced strawberries and Oreo pieces. 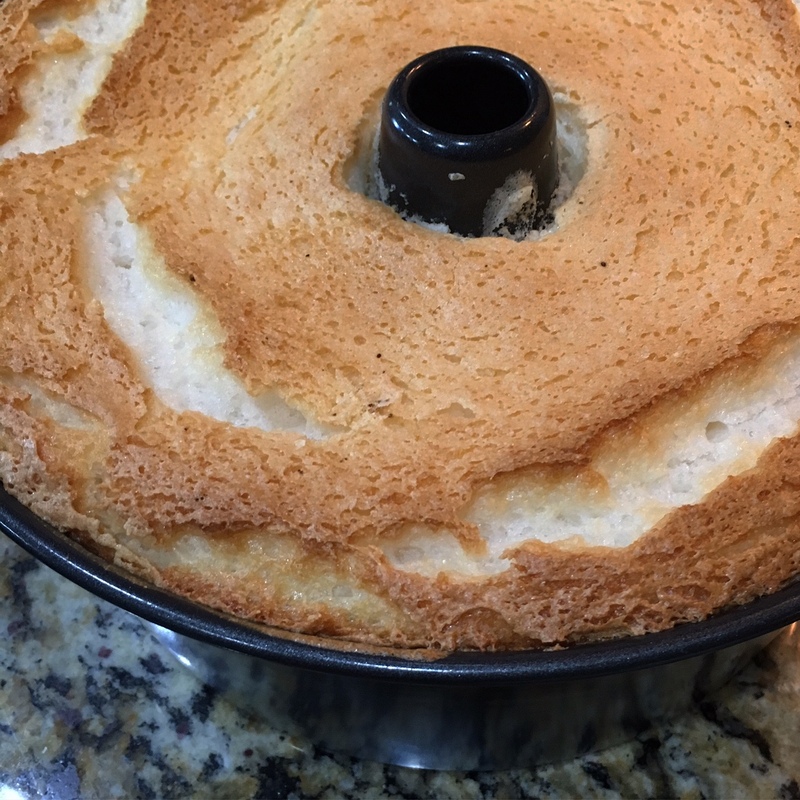 Once your angel food cake has finished baking and cooled, cut and/or rip it into small pieces. 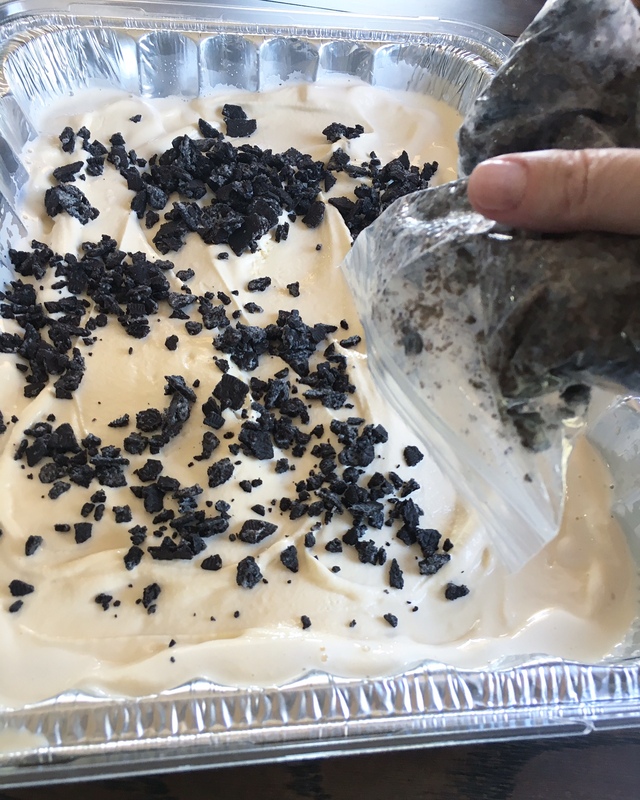 Fold your cake pieces into the softened ice cream mixture and flatten it out making a smooth top. 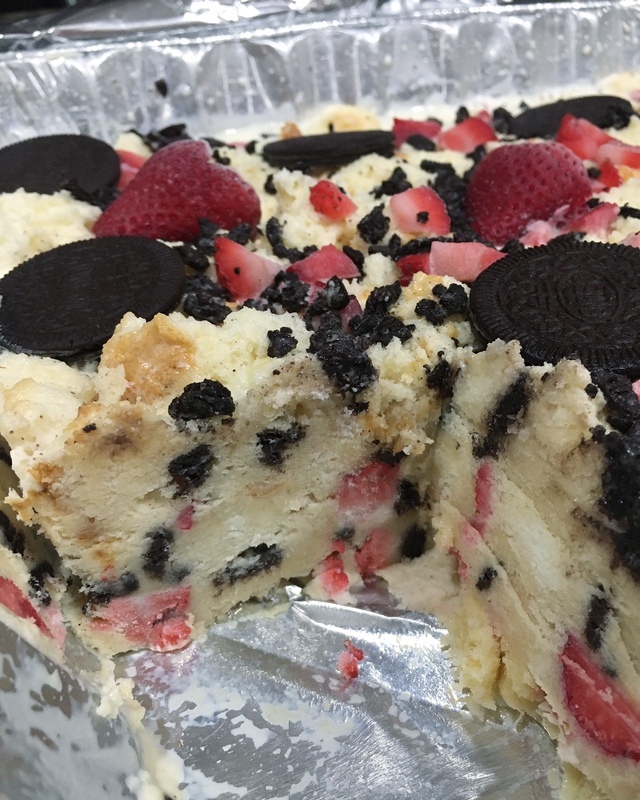 Before you refreeze your ice cream cake, decorate the top with your leftover Oreos and strawberries. 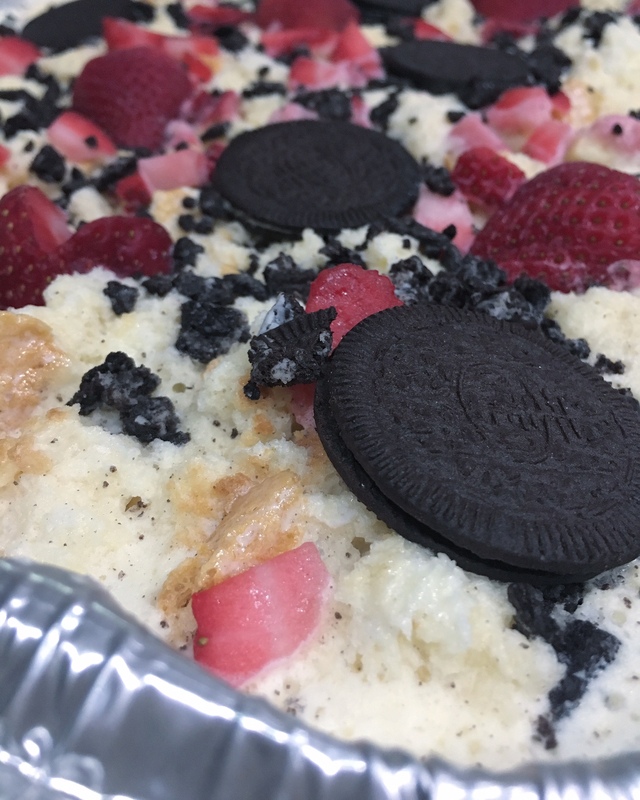 With your saved Oreo Thins, mash up half and sprinkle around, and then place the remaining few whole Oreo Thins strategically around. 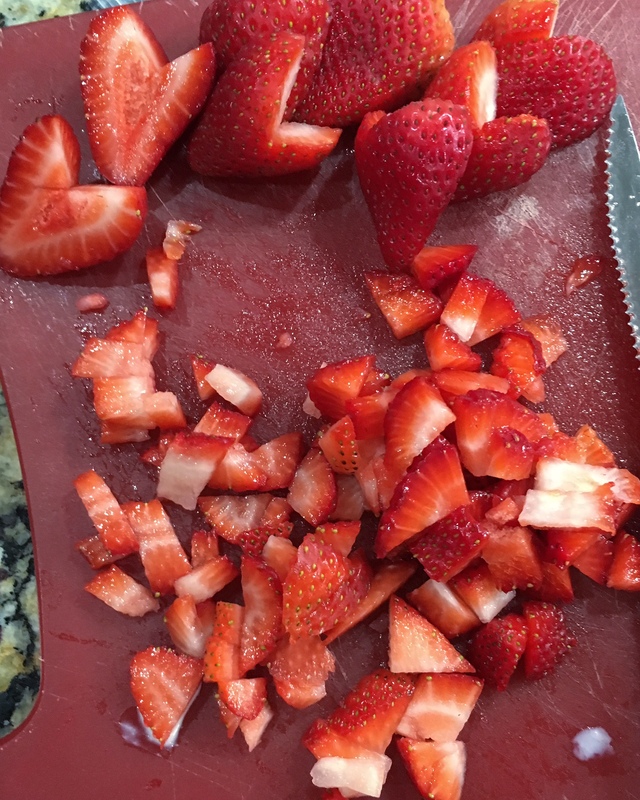 Do the same thing with your strawberries, sprinkle the diced pieces around and then strategically place your strawberry halves in the open spots. These touches make it look extra delicious. 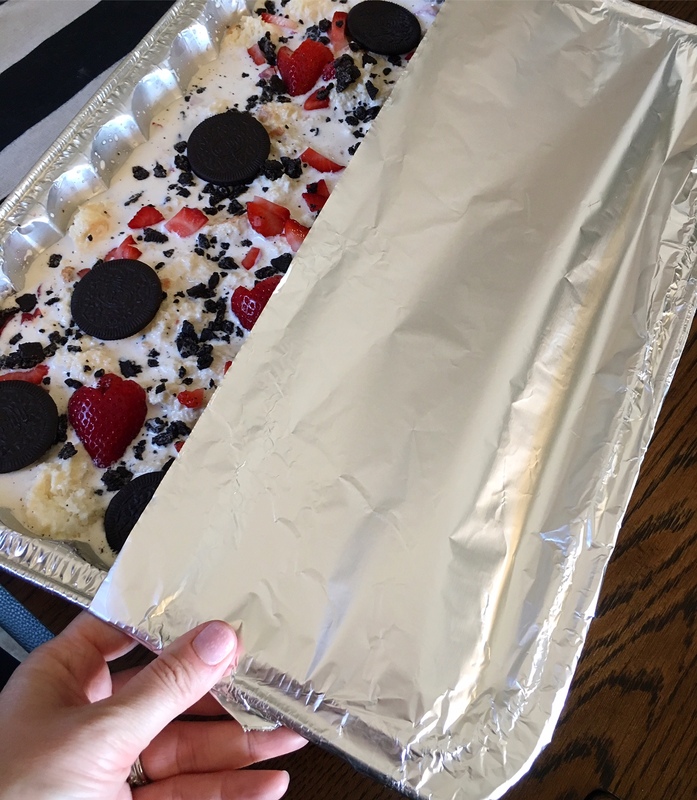 Make sure to cover your cake with aluminum foil and/or a lid if your pan comes with one, and freeze over night or as long as needed. Let your cake sit out for approximately 15-20 minutes before serving, so that it is at the perfect softened temperature for your guests. This recipe yields 20-24 heavenly pieces! PIN this recipe for later, you will thank me for it! Thanks for the love. So glad you enjoyed it! This really does look heavenly! And I love how easy it is! 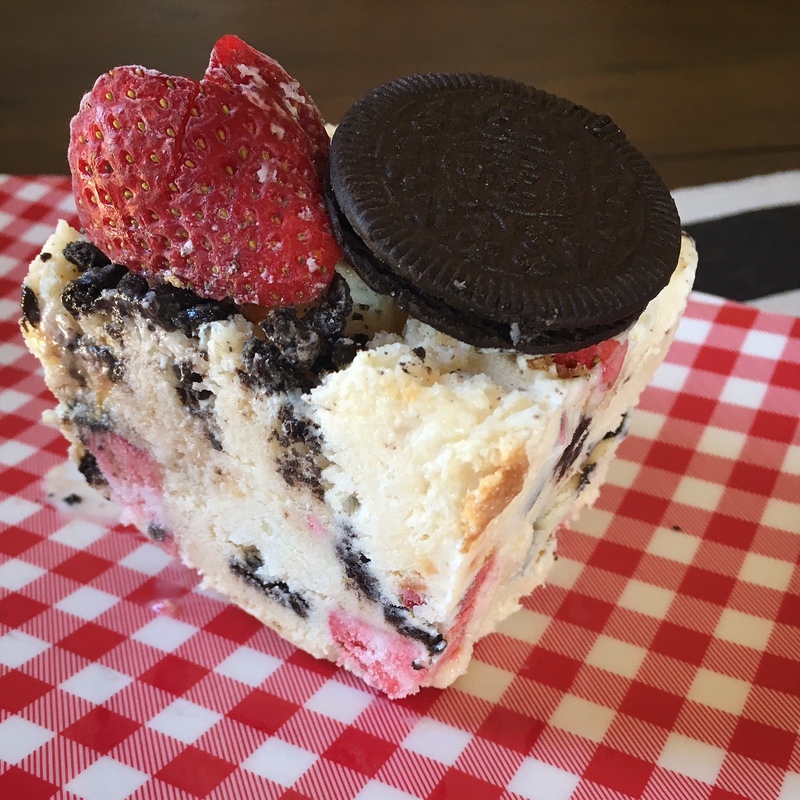 So easy to make and a total WOW for your guests! yumm.. i’m allergic to strawberries, would it be weird to have it without?! You can make it with any ingredients! 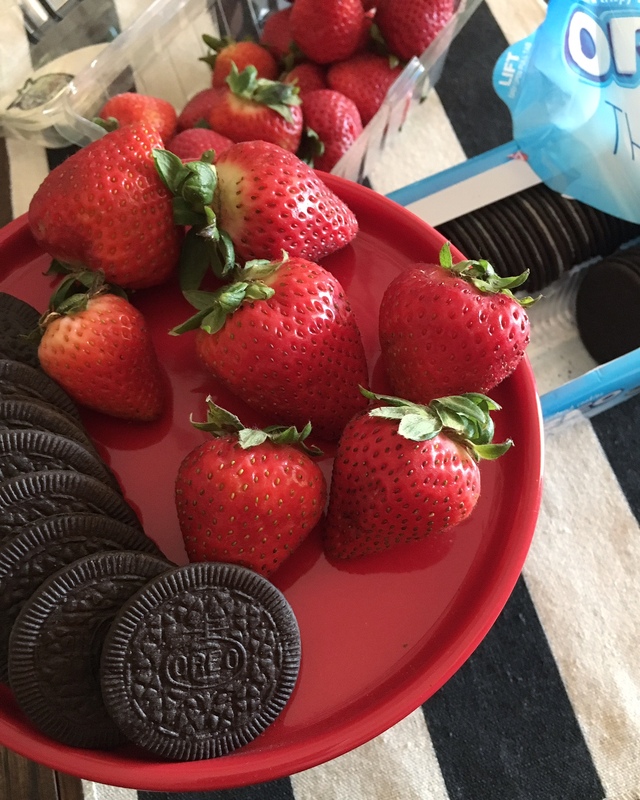 Just switch out the strawberries with another fruit or switch it up with candy or cookies! 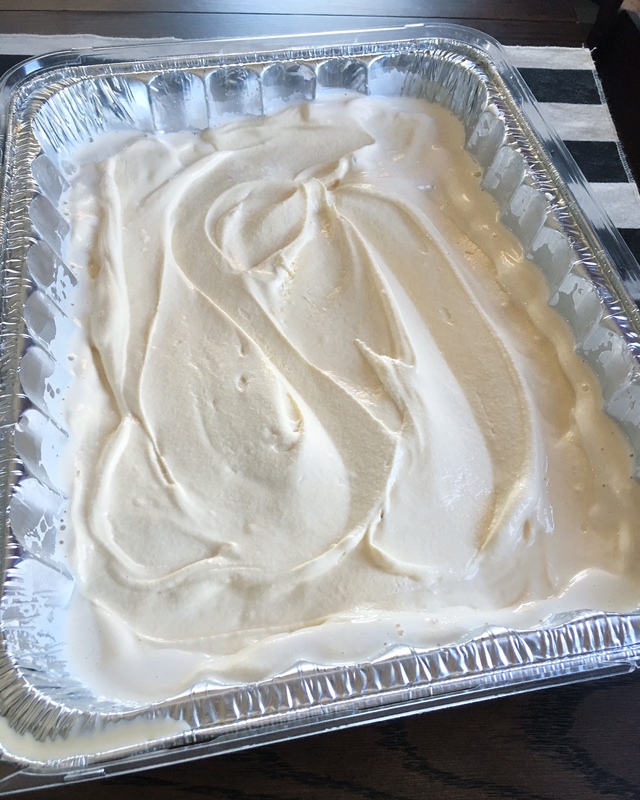 My grandmother always used to make Angel Food Cake….it brings back so many memories! This version looks soo yummy too! 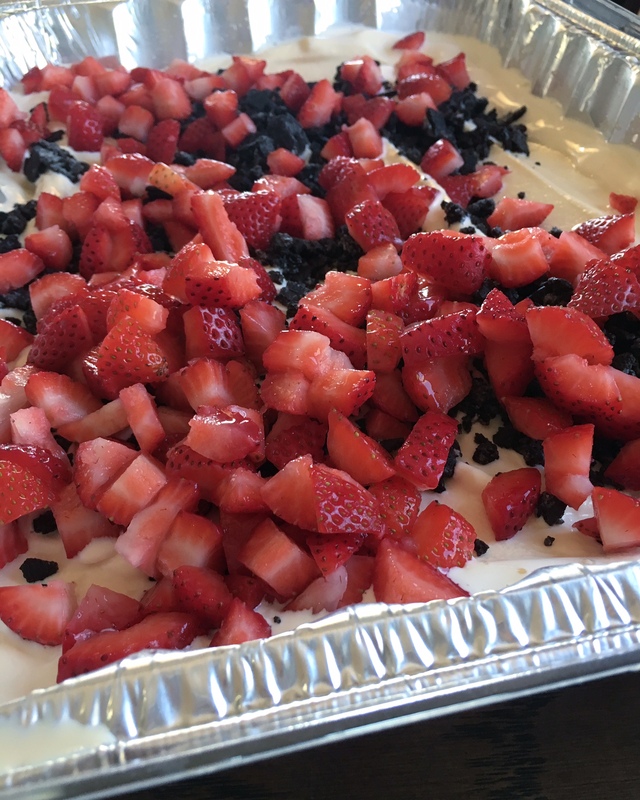 Jaclyn – I was also raised on Angel Food Cake and love it! This is a fun version! 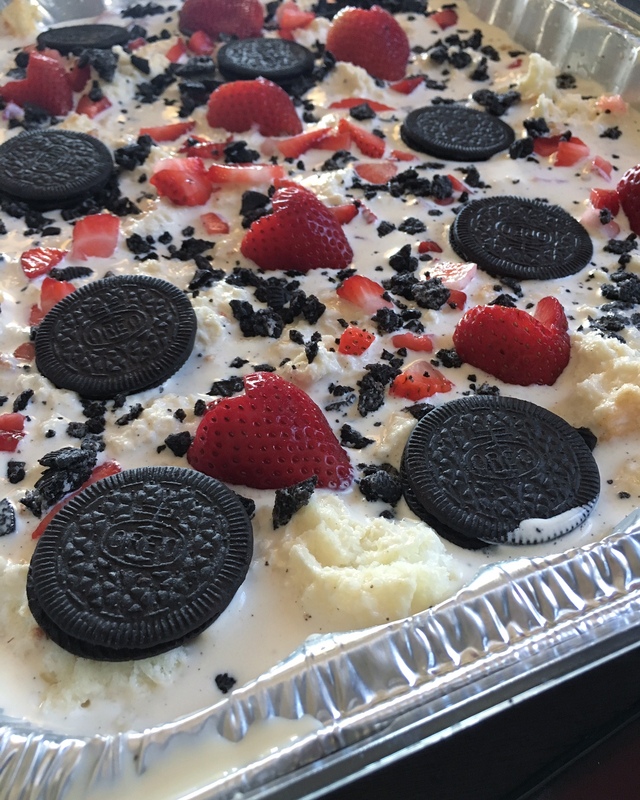 Ummm I need to make this RIGHT NOW! Looks so yummy! So yummy, you will love it! This looks sooooooo delicious and easy too!! My family would be all over this!!! It is perfect for a family day – enjoy! I literally want to dive into this faec (mouth) first. It looks amazing! Chanel – HA HA it is a good one! Oh my yum!! I had to clean the drool off my keyboard just so I could type this message! LOL Definitely going to give this recipe a shot! Nicole, HAHA I love your comment! It is a great one! This really does look heavenly!! I’m going to make this for the 4th of July since I missed it on Memorial Day. It will be perfect for the 4th! This looks absolutely amazing!!! 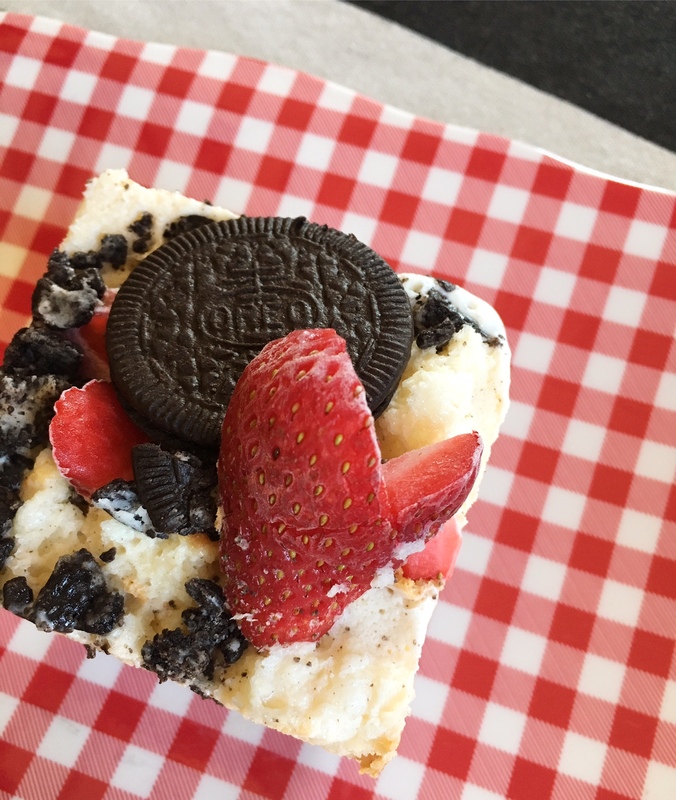 I love angel food cake, so I’m totally making this! It is a fun recipe to mix and match ingredients with! OK I’m definitely adding this to my recipe lists because these are seriously all of my favorite things!! And all together this is like dessert heaven! Yes, Merichelle, you will love it!